In my last post I discussed the challenges of getting my two-year old to eat veggies, in this post I am going to discuss how we used Kombucha to rid the evil apple juice addiction. So why did I give him apple juice to begin with? My husband and I do not drink juice, we do not drink soft drinks. Our fridge consists of water, sparkling water, milk and the occasional beer or wine. I never really had juice as a child. I never really thought it was good for him but I guess it was like a treat much the same way you give them a sweet biscuit or a chocolate thinking it can’t hurt them. Then the quantity increases as they want more. The once off glass of half apple juice, half water turned into a regular glass each afternoon after kindy and he was soon asking for more. I realised this was turning into a bit of a sugar habit, with the increase of asking for juice and then lollies, chocolate and party cake (as he calls it). A regular afternoon snack of juice and tiny teddies. He is only 2! But I can see how easily this can get out of hand once the (sugar) tantrums kick in and after all we had this food as kids didn’t we? As a kid I was lucky to have these “treats” once a month and maybe just at a party but I feel now because we have easy access to these foods we seem to be giving them to our kids more often. What are you thoughts on this? I tried taking the apple juice off him cold turkey but instead, he would stand in front of the fridge screaming, and if I offered water he would tip out the water all over the floor when he realised it was not juice. The tantrum would often lead into dinner time and then bath time and ………… you get the picture. So where would I find this mysterious drink? Luckily a friend told me there was a stall at the Northey Street Markets. We went there and met the wonderful family from Buchi Kombucha. The lady told me how her children just loved to drink it and even helped with the brewing process. I brought a bottle of the natural flavour straight away, excitedly took it home and gave Mr 2 -year- old some with some water and told him it was juice. His first response was to spit it out everywhere! It does have a strange taste (certainly to juice) but it is not an offensive taste. This time I decided not to give in and did as Mrs Buchi suggested giving it a few goes, so I tried again and again with no luck. Then I gave him some without the water and guess what – he took it and asked for more! Finally! I went back the next week and tried another flavour – Hibiscus Pine Lime. Now this one did not look like juice but the flavouring gave it a more sweeter taste – this one was a huge hit! Then the hubby tried it and suddenly we were going through at least 2 bottles a week – uh oh what have I done now!!?? I went back to Buchi and I brought one of their starter kits. 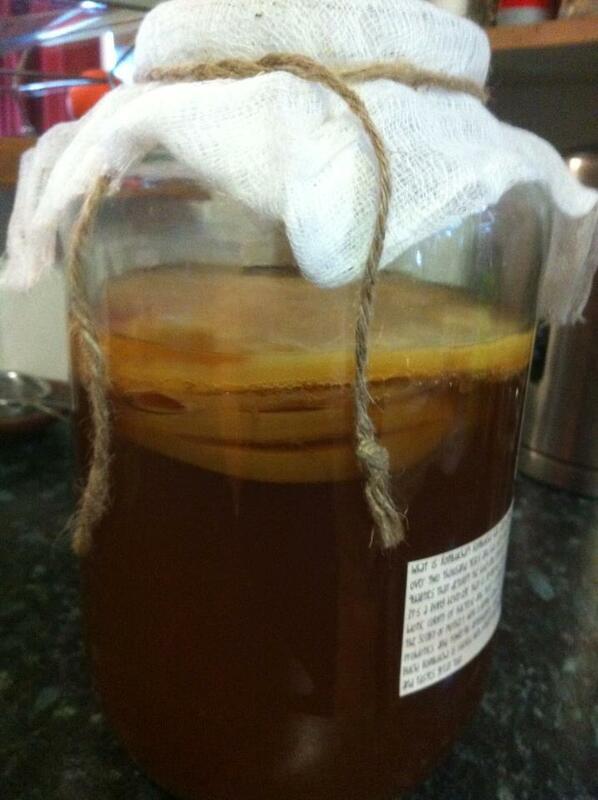 It contains the scoby (mushroom) with some starter tea, tea bags, sugar, vessel – everything you need to get started. All I needed to do was follow their very simple instructions and our first batch was brewing. At around the 10 day mark we tasted the brew to see how it was going. I felt it was still a bit too sweet but hubby thought it was ready so we bottled it and started the process again. Now we are up to brewing 10L a fortnight to hopefully give to family and friends (if we don’t drink it all)! It is very inexpensive to buy the kit and very inexpensive to make new batches with only the cost of tea and sugar. I usually buy the Aldi brand organic black and green boxes of tea. Now Mr 2-year-old no longer asks for juice but asks for boocha and I am no longer keeping apple juice in the house! I have noticed for myself that I only need a small amount of kombucha to feel refreshed and energised and that half a glass every few days seems to be enough. Stay tuned: In my third blog post about Kids and Paleo I will discuss lunch boxes and how I overhauled a lunchbox of sugar and share some recipe ideas. I think it is safe to say I do obsess a bit over food, I think about what the family is going to eat a fair bit of the time, I menu plan (blog post to follow soon on how I do this), I research recipes, I research places to source food and because we are on a budget I check the latest specials and all of that before even cooking the food! So I do spend a fair bit of time thinking about what to feed my 2 year old son (I am sure I am not the only one). Is it ok to feed him ‘typical” children’s food like vegemite sandwiches that I ate everyday as a child? If this food caused me issues later in life why should I subject him to eating non paleo foods and running the risk of future health issues? My philosophy on meal time is that I have always refused to cook a different meal for my son and a different meal for us. At times I have struggled with this but long term it has been better for the family eating the same foods together at the same time. This is our family ritual. But like a typical 2 year old he is fussy and it’s hard to get him to eat at the best of times especially when he has discovered his sweet tooth and asks for party cake and lollies! So apart from the approach of us all eating together I got him involved in cooking with me. We have Mondays at home together and we often make some lunch box snacks for the week. This has worked well with him trying different things as we are cooking (licking the bowl, eating what we have baked while it is still warm). We have the cookbook “Eat like a Dinosaur” which has great ideas for kids Paleo meals with easy instructions and how kids can help you in the kitchen – as an extra bonus my son just loves Dinosaurs! I find some of the recipes are a little unusual to our tastes and I sometimes modify them to suit us but the ideas are absolutely fantastic. After all this I still had a problem with dinner time and in particular vegetables! The first article was interesting in that it gives 5 tips (based on scientific research) such as making the food visually appealing with lots of colour, how kids like to imitate (so making sure you are eating what’s on your plate) and repeated exposure to foods to name a few. This made sense but the second article they referenced really sounded like fun and we thought why not give it a go! It talks about renaming normal food with catchy names that kids will like. 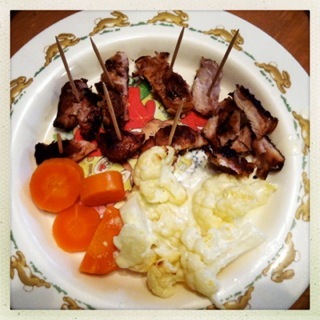 I read it, I got excited I was about to serve dinner and oh no I needed a catchy name quick so salad became “Lion Salad” and chicken kebabs became “chicken on a stick”. I know great first effort Mum – not!! 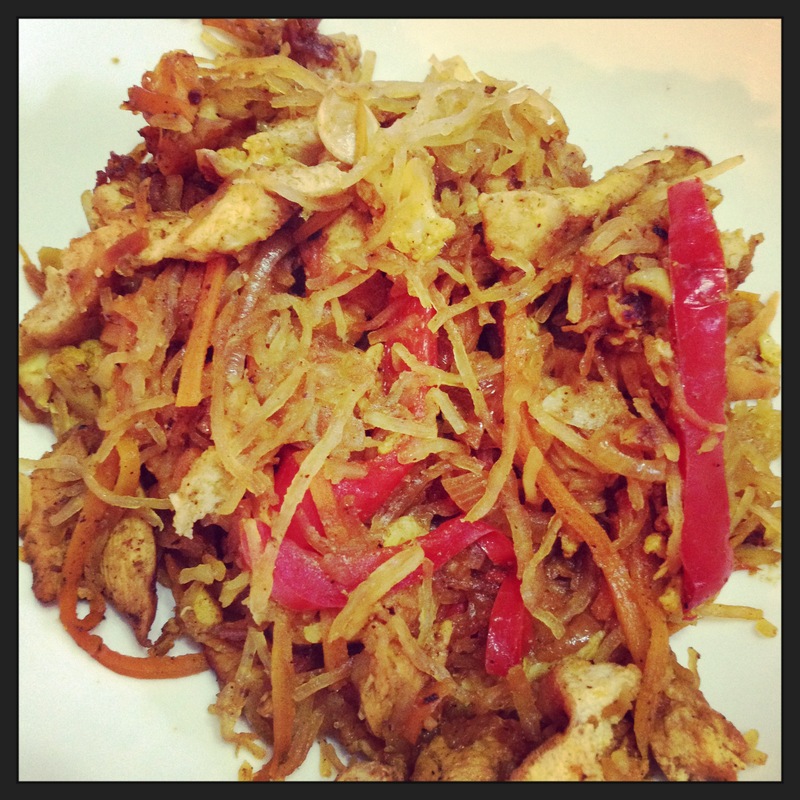 But guess what – to my surprise he thought Lion salad was so cool he ate it and roared like a lion after every bite. This was the first time I had seen him eat salad willingly! And well we all know kids love anything on stick so the chicken was eaten too. Wow relief, an easy dinner. Again it worked – was it really this easy all along? Since then meal time has been a lot easier with him trying the foods with the funny names. 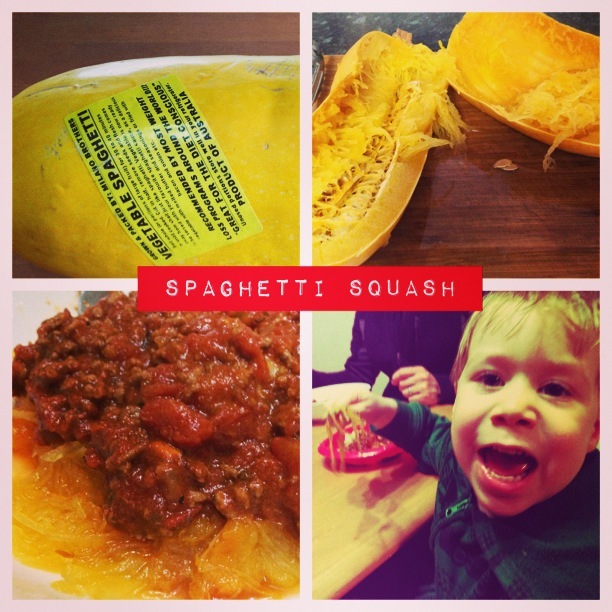 We do have the occasional set back – after all he is only 2 but on the whole a few simple tweaks at dinner and we are all enjoying meal time a lot more. What successful strategies have you used in the past to get your kids to eat food? I would love to hear them. Stay tuned: In my next blog post I will discuss my son’s absolute love of apple juice and how we used Kombucha to ease this sugar addiction before it got too out of control.